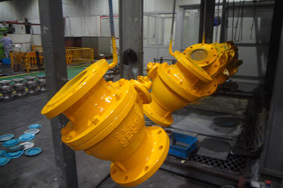 Trunnion-Mounted Ball Valve as a high-performance ball valve is used for general industrial pipeline and long-distance pipelines, whoes strength, safety,property resistant to harsh conditions and others are given special consideration when in the design.Compared with floating ball Valve,the acting force that the upstream fluid pressure generates on the ball is all transferred to the bearing and not bring the ball to the seat when trunnion-mounted ball valve is working,thus the seat would not bear too much pressure. Trunnion-Mounted Ball Valve as a high-performance ball valve is used for general industrial pipeline and long-distance pipelines, whoes strength, safety,property resistant to harsh conditions and others are given special consideration when in the design.Compared with floating ball Valve,the acting force that the upstream fluid pressure generates on the ball is all transferred to the bearing and not bring the ball to the seat when trunnion-mounted ball valve is working,thus the seat would not bear too much pressure. 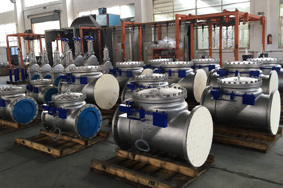 So trunnion-mounted ball valve is applicable to high pressure, large-caliber services due to its small torque,stable sealing property,long service life. Advanced spring pre-seat components feature self-tight , and the upstream seal.There is no flow restriction on the installation as a result of bidirectional.Trunnion-mounted ball valve has two types of body structures: two piece and three piece.Flanges is jointed by the bolts.Sealed by inserting into the stainless steel ring with PTFE.Springs at the back of steel ring is to ensure that the seat is glued to the ball and keep sealed. The upper and lower stems are provided with PTFE bearings, which can reduce friction,save labour. An trimmer on the small shaft's bottom assure the junction of the ball and the sealing ring. 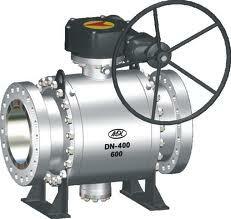 Keywords: Valve Manufacturer, Valve Supplier. 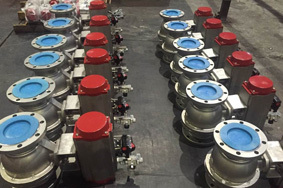 Links: Valve Manuacturer, China Valve Supplier, Forged Valves China.